Does owning your own home seem like a distant dream? Have you got the focus and determination to build your own property? Learn how to build your own gingerbread house! Delicious and Tempting. 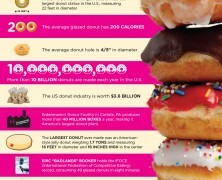 See some interesting figures about you favorite pastry snack before noshing the next dozen donuts.